King County monitors the ecological health of Pine Lake Creek in a variety of ways, including collecting and analyzing water, sediment, and benthic invertebrate samples. 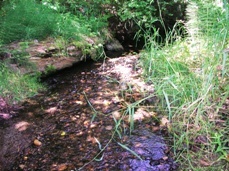 Since 1987, water quality samples have been collected monthly near the mouth of the creek at Station A680. The station is located downstream of the railroad tracks between East Lake Sammamish Parkway and the East Lake Sammamish bike trail. Sediment samples have been collected from Pine Lake Creek as part of the Streams Sediment Monitoring Program starting in 1987. King County began collecting benthic macroinvertebrate samples in Pine Lake Creek in 2002. The Pine Lake Creek sub-basin is located within the City of Sammamish, Washington and drains 1,175 acres from the East Lake Sammamish Subbasin into the lake along the eastern shoreline. Pine Lake Park, a 16 acre park, is an important recreational and aesthetic resource to the City of Sammamish. Land use in the Pine Lake Creek sub-basin is mostly developed and forest. Low intensity and open spaced is the most common type of developed land use while mixed forest is the most prevalent among forested lands. Relative to land that is developed or forested, there is not much scrub, wetlands, or other land uses (grassland and open water); and agriculture is not present. See Table 1 below for more details on land use. The 1994 East Lake Sammamish Basin Plan identified Pine Lake Creek as providing habitat for anadromous fish use up to River Mile (RM) 0.6 and resident fish use above that. Good spawning substrate was found in the lower section of the creek. Pine Lake provides valuable fish and wildlife habitat for many species. In 1988, drainage from a large wetland was diverted from Pine Lake into Pine Lake Creek to reduce nutrient loading to the lake (King County, 1994). State water quality standards were revised in 2003. Pine Lake Creek is now categorized as “Core Summer Salmonid Habitat” for aquatic life use, and “Extraordinary Contact” for recreational use. As part of the updated water quality standards, portions of Pine Lake Creek have been assigned an additional “Supplemental Spawning and Incubation Protection” temperature criteria of 16 °C. The creek is on the Washington State Department of Ecology’s (Ecology) 303(d) list for violation of water temperature, DO, and FC bacteria standards (Category 5). King County operates a stream gage on Pine Lake Creek near its mouth at the Sammamish River Parkway (15b). Sediment data were collected from Pine Lake Creek as part of the Streams Monitoring program starting in 1987. Data were compiled and analyzed for the years 1987 through 2002. Data were analyzed for trends, correlations, and were compared to sediment quality guidelines. No significant trends were identified during data analysis for any of the parameters tested. Results indicate that Pine Lake Creek sediments did not exceed any sediment quality guidelines. Of the 27 steams monitored in King County, Pine Lake Creek had the 11th lowest metals concentrations. For more information about benthic macroinvertebrates and King County’s Benthic Macroinvertebrate Program, please visit the King County Stream Bug Monitoring webpage. To see the benthic macroinvertebrate data for Pine Lake Creek, please visit the Puget Sound Stream Benthos webpage.